Seoul (VNA) – Hundreds of businesses in the Republic of Korea (RoK) participated in a conference in Seoul on March 26 to seek trade, investment, and tourism opportunities in Vietnam’s Central Highlands province of Lam Dong. Addressing the event, Doan Van Viet, Chairman of the provincial People’s Committee, introduced the locality’s major characteristics and socio-economic development situation for the Korean firms. He highlighted the province’s advantages in year-round cool weather conditions and convenient transport system with easy connections to key economic regions of Vietnam. Viet said that Lam Dong has favourable conditions for socio-economic development, especially in high technology agriculture and tourism. Da Lat city – Lam Dong’s cultural-political centre – has become a famous national tourism site and an ideal destination for foreign visitors, he noted. He suggested that Korean businesses invest directly in projects in which the province is calling for investment, or partner with Vietnamese firms to expand projects already underway in Lam Dong. The official held that businesses of both sides can collaborate in designing tours between the two countries and trading goods between the RoK and Lam Dong. Viet pledged that the local administration will always accompany businesses in building a smooth, transparent, and friendly investment environment and sustainable ecology environment. Lam Dong is willing to support businesses in removing any obstacles facing them and creating optimal conditions for investors in the province, he stated. 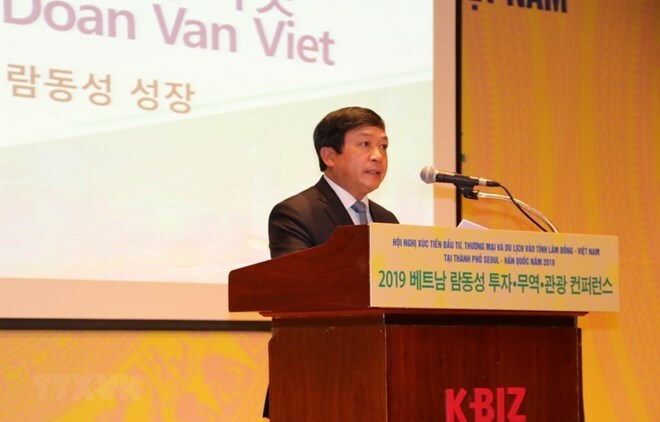 Meanwhile, Vietnamese Ambassador to the RoK Nguyen Vu Tu said that the conference was held at a crucial time as many Korean businesses are highly interested in the Vietnamese market. He expressed his belief that the event will help Korean investors explore the economic situation of Lam Dong and Vietnam in general. According to the diplomat, the Vietnam-RoK partnership has grown in all fields. The two sides will mark 10 years of the Vietnam-RoK strategic cooperative partnership in 2019, he noted, adding that the sound political relationship and close people-to-people exchange are among factors ensuring the efficiency of economic activities between the two countries. The Korean government is implementing its “New Southern Policy” with the aim of promoting cooperation with the Association of Southeast Asian Nations (ASEAN), in which Vietnam is among the prioritised partners, said the ambassador.